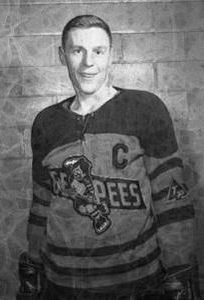 Ed Hoekstra born in 1937, played minor hockey in Winnipeg and then followed his older brother, Cec (2001 HOF player inductee), to play junior for the St. Catherines Teepees where he scored 102 goals in four seasons. Hoekstra played one season for the Philadelphia Flyers and 97 games for Houston Aeros of the WHA. He was a journeyman who chalked up 833 points in 965 games in places such as Quebec, Cleveland, Buffalo, Denver and Springfield. He died in 2011.